• An office with at least 1,000 newspa­pers in untidy stacks, kept be­cause "I may want to clip them sometime." • Two radios whose news flashes sometime speed him to the teletypes on another floor. • A Sears, Roebuck catalogue for aid in drawing household articles. • Pictures of Washington politicos, for caricaturing same. • Some turkey feathers, gift of Fred Seibel, Richmond (Va.) Times-Dispatch cartoonist, for brushing art gum eraser leav­ings off drawings. • Goutless legs to facilitate trips to the Capitol. "Editorial cartooning should express sincere convictions," says Herblock, whose six-a-week cartoons are syndicated by Post-Hall, New York. "The work is like that of a colum­nist or editorial writer—to find out as much as you can—and then put it down on paper." In discussing his work, which is notable for its expressive drawing, Herblock minimizes drawing. "First, be right; then, be effective; then, be a good artist," he told us, in the clear­ing that is two chairs in the center of his small, cluttered office. In a field where an idea is the pearl of great price, he doesn't worry about ideas. "You find you are doing fewer cartoons about the weather these days," he observed. "Things are going pretty fast —there's a lot happening, of consequence. You sit here and see these things coming up in Congress. It isn't a matter of finding a subject, it's a matter of deciding which is better to do. "I don't think an editorial cartoon necessarily has to be funny—or with words or with­out words," he continued. "The only rules are general rules— it should be simple. You should say something." And so if you bring up one of his recent cartoons dealing with Senator McCarran and the Displaced Persons Bill, the car­toonist immediately forgets the cartoon for the subject matter. "Gee, I'm glad it finally went through," he said—of the bill, not the cartoon. Adding that in his opinion, Senator McCar­ran was "a one-man bottle­neck." Mention of a cartoon on Senator Kerr and the natural gas bill brought the quick, earnest question: "Do you think Truman'll sign it?" Herblock works hard, in un-prima donna fashion, having no favorites among his own work. 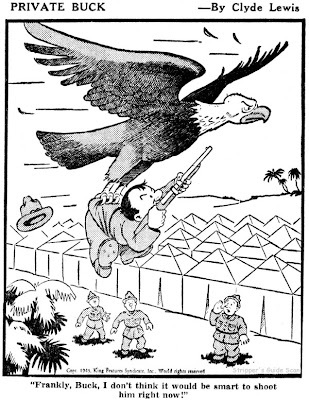 A cartoon titled "British Plane," showing an anxious German soldier watching the sky while grinning Frenchmen looked on, brought him a Pulitzer Prize in 1942. Herblock says it was "allright, but I had drawn a lot on aid to the Allies." A Sigma Delta Chi award in 1949 pleased him mainly be­cause of the citation which termed his work "the product of a genuine and integrated philosophy. His cartoons are always simple, never labored." The cartoonist's appraisal of his own philosophy: "Liberal? That word's been kicked around a lot. I'm for democracy. I've never been against the little guy." He recently won a Heywood Broun Award. No slave to system, Herblock's day usually begins at 10 a.m., includes reading about four papers a day (the Washington Post is the only regular). He settles on a subject by lunch-time. Depending on the gen­eral heat and light of Congres­sional doings, he may go up to the Capitol to make sketches, follow happenings. He's been at the Capitol every day of the McCarthy hearings. Next step is to make different sketches on the selected sub­ject. A McCarthyism cartoon which went to newspapers in the form of a GOP elephant reluctant to get atop a wobbly stack of smear buckets might have said the same thing a dif­ferent way. Other ideas for the same cartoon, sketched but later rejected, were: the GOP elephant with Gabrielson atop the elephant's head but reluc­tant to get out on the end of the trunk with McCarthy; and a blindfolded elephant carrying McCarthy, Bridges, Wherry and Taft, all grinning, while a dour Vandenberg looked on. 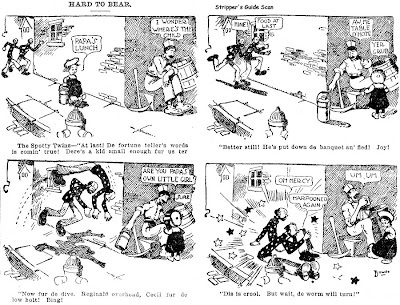 Herblock has drawn as many as 20 sketches in trying to hit on the day's cartoon. Washing­ton Post Editor Herbert Elliston makes the final selection. The cartoon is then brushed in and Herblock always wishes he had more time. The 40-year-old native of Chi­cago was a cartoonist for the Chicago Daily News at 19, doing a two-column insider, generally in light vein, while Vaughn Shoemaker did the front-pager. In 1933, he went to NEA serv­ice, stayed 10 years until he en­tered the Army. 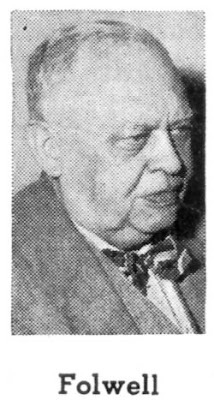 The first of 1946, the ex-sergeant joined the Washington Post, and soon Post-Hall was distributing his cartoons, which showed among other things, the Herblock Atom. His Atom, a sort of bomb-shaped robot, has caused a lot of comment. A 1950 laurel to Herblock was that the National Gallery of Art's Rosenwald Collection bought several of his cartoons. (Britain's David Low is the only other cartoonist represent­ed in it.) Another plaudit has been the recent interest in ex­hibiting his work. A showing of 200 of his cartoons at the Corcoran Art Gallery in Wash­ington in January and February attracted President and Mrs. Truman one Sunday morning. 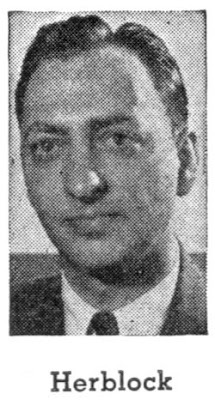 Says Herblock of the visit, "He was nice and pleasant." 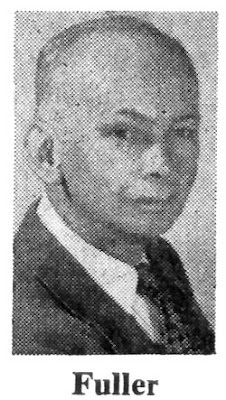 Clyde Lewis jumped ship from NEA, where he helmed the daily panel Hold Everything and the Sunday strip Herky, in early 1940. He went to King Features to start a new panel, much in the same vein as Hold Everything, titled Snickeroos. The market, overloaded with such fodder, didn't respond with much enthusiasm, though, and within six months Lewis had come up with a new tack. The panel was renamed Private Buck and a diminutive army private was installed as the daily gag fodder. The change didn't liven up sales one iota, but Lewis gamely hung on with a tiny list of papers all through 1941. As of December 7th he suddenly had a big hit on his hands. As the US entered the war papers were scrambling for military material and Private Buck was happy to oblige. Unfortunately for Lewis, the US Army was also interested in him and he was inducted shortly after his panel turned into an overnight hit. 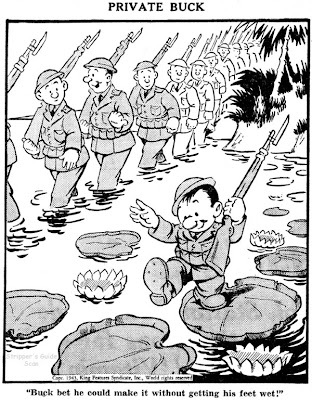 Like some other GI cartoonists, Lewis somehow managed to keep up the daily grind despite being overseas. 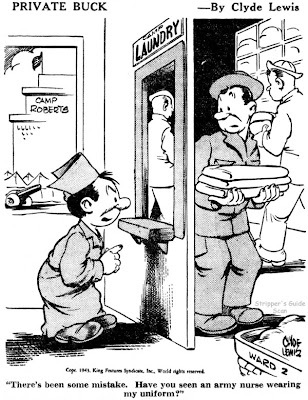 Some Private Buck cartoons bear the names European locales next to Lewis' signature, indicating that he wasn't one of the lucky ones to score a desk job. When the war ended, Private Buck went back to civilian life and the panel was rechristened Private Life of Buck. The feature shed papers pretty quickly, though, and was finally cancelled on April 19 1952. 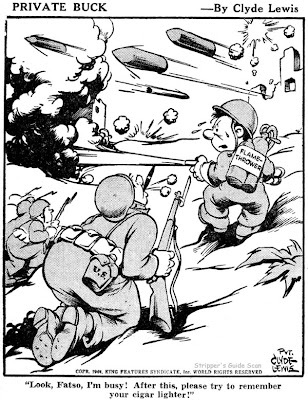 On the subject of war caroons (of which there were many): Harry Chesler had a magazine called Mirth of A Nation 'reprinting' war cartoons that seem to have been intented for syndication. I have to go upstairs to get the titles, but do you know if any of those were actually run somewhere? The only Chesler strip that I have been able to verify on newsprint is his short-lived "Little Nemo" revival. It is obvious from a number of Chesler publications and paperwork that has surfaced that he was trying to do newspaper syndication, but his luck at it seems to have been pretty bad. Ger, if you'll give me those titles I'll try running them through the newspaperarchive search to see if anything turns up. My name is David. I have just purchased a comic called Mirth of a Nation from 1940 (I think). Is this the one that you were speaking of? If so, can you give me any information about it? Thank you for your time. The Spotty Twins by Art Bowen ran as part of the Chicago Daily News' daily comics and cartoons page. Bums and hoboes were a popular subject for cartoon hijinks in the day, especially at the Daily News, where these fellows cavorted in the company of fellow ne'er-do-wells Brainy Bowers and Circus Solly. The strip ran sporadically for a year starting in January 1905. Art Bowen was an excellent cartoonist with a fine eye for visual comedy (which was a good thing since he wasn't much as a gag writer). He never really made a big impression in newspaper cartooning. The Spotty Twins was his first continuing series (he did lots of one-shots for the Daily News as well), and then he drops off my radar until 1910 when he arrived in New York and got a few minor newspaper cartooning gigs there. That only lasted until 1913 when he disappeared once more, this time for good. Allan, I have an Arthur Bowen, a Chicago cartoonist attempting suicide in 1916. My citation is The Day Book, November 24, 1916, p. 8. "Dear Mr. Fuller," the letter said. "Please have more dragons. My children love dragons." Ralph Fuller,who draws and writes AP News-Features' "Oaky Doaks," was glad his pleasant lizzarddy looking dragons had met with such good reader reception. But he couldn't promise another passel immedi­ately. Action of his comic adventure strip, full of "Thud and Blunder," according to the promotion, pre­sumably transpires in a medieval kingdom. But Mr. Fuller thinks nothing of throwing in a tele­phone for convenience of char­acters at King Corny's court. His comic vehicle is so aptly contrived that the cartoonist's im­agination can range considerably beyond just dragons. "I liked a sequence when Oaky was captured by the Vikings," Mr. Fuller confides. "They got over to the American Coast and got mixed up with the Indians. That gave me Vikings, and Indians as well as knighthood to burlesque. "I just finished a Sunday se­quence where there was a combi­nation of pirates and Indians and buried gold, shipwrecks, cast-ashore-on-a-desert-island, and any­thing a kid would want in a fea­ture. I was sorry when I had to quit it." The 60-year-old cartoonist was wearing a red tie and a blue tweed suit in his light green studio, which is curtained in gold and overlooks the back lawn of his Tenafly, N. J. home. "I think every man has a little of the knight in him," he observed, in explaining why he took to the idea of "Oaky Doaks" and launched the daily strip June 17, 1935. Bom in Michigan, Mr. Fuller was 16 when he sold his first car­toon to the old Life for $8. The next mail, he received a Life letter saying, sorry, they had al­ready used that joke and would he please send back the $8. He did. But he soon sold them an­other cartoon. He attended the Chicago Acad­emy of Fine Arts, and while working as a staff artist for the Chicago Daily News, he got $100 for the first colored picture ever reproduced by Life. That sold him on the magazine market. He decided to come to New York. He free-lanced widely for a number of years, but when Life and Judge began to fold, he saw the magazine market was dimin­ishing. He started looking around for a comic strip. 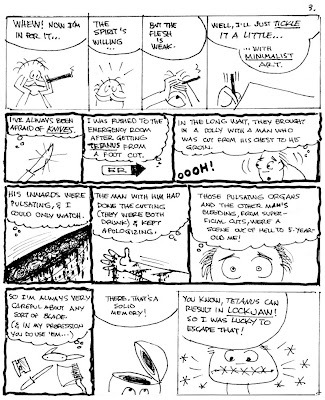 AP Features, at that time, was interested in a detective strip and asked him to try one. But Mr. Fuller has always believed comics should be comic. And one day back in 1935 he had a big decision to make. He had a syndicate offer to take over one of the top humor strips be­cause it looked like the creator was going to walk out on his con­tract. On the other hand, AP had several pages of continuity for a new strip that had been drawn up by young William McCleery (who was later to become head of the feature department and then a playwright). Mr. Fuller remembers he took the pages of continuity over to the lobby of the Roosevelt Hotel to read them—and when he'd finished, he'd decided in favor of the new strip. He liked the idea of Knighthood in King Arthur's court, he saw the comic possi­bilities and he also preferred a strip that could carry his name. So Oaky Doaks, a young blundering country boy who made good at court, came into being. The strip was daily at first with Mr. MeCleery writing the con­tinuity, but after awhile Mr. Ful­ler took that over. In 1941, the comic went Sunday, too. In producing the strip, Mr. Fuller uses uncluttered non-busy backgrounds for his comedy of situation. "I think a situation is funnier than a gag—but if you get both, it's really fine." While claiming he has nothing to "get off his chest" but humor, Mr. Fuller is perhaps jousting in more than jest: "Maybe I'm try­ing to burlesque the serious ad­venture strips, I don't know," he says. Debbie Deere seemed like a natural for a soap opera strip. Our heroine worked at a newspaper writing an advice column a la Ann Landers. Unlike her real-life counterparts, though, she invariably became personally involved with her lovelorn correspondents and melodrama ensued. The art by Frank Bolle was a perfect fit for the subject matter, and improved on the typical soaper look by staying away from the endless talking head routine that afflicted some others. The stories, written anonymously, were perfectly good soap opera matter. Why then did it fail? I can only guess that the genre was already filled with no room left for a new entry. With Mary Worth, Juliet Jones, On Stage, Rex Morgan and Judge Parker already firmly ensconced on the nation's funny pages, perhaps a new soaper entry simply had no empty slots to fill. Joe Brancatelli in The World Encyclopedia of Comics says that the scripts were provided by none other than Al Jaffee, he of Mad magazine fame. Without additional confirmation I have to take this nugget of knowledge with a grain of salt. At McNaught Syndicate Bolle often worked with writer Nick Meglin on Children's Tales during the same period, and I can't help but wonder if the two Madsters might have gotten mixed up by Joe. Does anyone have more info? UPDATE: Joe Brancatelli writes to tell me that the Jaffee credit came straight from the horse's mouth. Joe sent him a questionnaire and Jaffee listed this credit thereon. As Joe pointed out, no one would try to pad his resume with a credit like this. Oh, and I failed to give running dates in my post. Debbie Deere ran 5/30/66 - 11/1/69. "Dear sir: My wife always gets mad when I look at my watch when I am talking to her. What about your wife?" This succinct statement of a married male's problem came by post to Ar­thur H. Folwell of the New York Herald Tribune Syndicate. The married male wasn't looking for advice. He was merely stating his case. "An admirable letter," says Mr. Folwell, who is no Dorothy Dix. As writer of the "Mr. and Mrs." daily and Sunday gag strip, he has simply chron­icled the wry plaints of the married—without solution—for 21 years. "I think if anything is to be said for "Mr. and Mrs.", it is the fact that we don't try to create a situation—we try to catch those already waiting to be used," he says. Psychologists might say get­ting the irritations of married life down on paper reduces their size. But whether that's so or not, Mr. Folwell's strip seems to establish the same sort of accord that exists between two long suffering men, waiting side by side for two wives shopping too long for too many things. He obviously lays bare many a universal situation. The most frequent comment from readers: "My wife says you must be hidden in our house somewhere." Being chronicler of the im­perfect and realistic seems to keep the 72-year-old sanguine. Wearing a rotund middle and a one-sided smile, he remarks: " 'Mr. and Mrs.'? They're happy as the average yeoman married. I don't think their state is unhappiness. It's the give and take of everyday life." "You can't," he added, "very well put them in the divorce courts." Of course there was a time when editors complained. That was years back, after the late, talented Clare Briggs, "a sprightly little man with a yellow overcoat and a cane over his arm," had started it as a Sunday page in 1919. The artist—perhaps to make draw­ing easier—would frequently close the page with a blacked-out panel, carrying the caption, "And so on, far into the night," indicating the verbal war didn't end at taps, Mr. Folwell says. But followers of Mr. Briggs have toned down the scrapping a bit while keeping the over­all flavor of the comic. And Mr. Briggs' reputation as a comic artist of high skill re­mains. "He could have drawn with a skewer dipped in ink and it would have been alright," says Mr. Folwell. Mr. Folwell's connection with the comic strip came about be­cause the late Charles A. Voight, "a cracking, good ar­tist" who drew "Betty" for the syndicate, was nevertheless sometimes late with his work. Brooklyn-born Mr. Folwell, who was on the pre-Hearst Puck from 1902-16, had had the spe­cial province of thinking up ideas for artists there. "I never in those days knew an artist that had an idea of his own," he says. Becoming editor of the old Tribune magazine in 1921 and drama editor of the Herald Tribune in 1927, he continued his dealings with artists. In addition, he had published his own humorous writings in vari­ous magazines—so he seemed a natural to work with Mr Voight. Later, in 1927, when Clare Briggs took an 11-week trip to Europe, Mr. Folwell was the obvious replacement on "Mr. and Mrs." And for the six months before Mr. Briggs died in 1929, the team of Mr. Folwell as writer, and Edward McBride as artist, filled in on the Sun­day page. Successive artists on the Sunday page were Frank Fogarty, Ellison Hoover, and currently, Kin Platt. In 1931 Mr. Folwell insti­gated the daily strip, which was drawn at first by Ellison Hoover, and is now drawn by Kin Platt. Mr. Platt wrote the Robert Benchley short film, "How to Read"; was radio comedy writer for Jack Benny and others; created "Supermouse"; drew Pepsi and Pete, the Pepsi Cola cops for two years; is now drawing two juvenile books. The method for preparation of the strip is "from Tinkers to Evers to Chance," says Mr. Folwell. i.e., from Folwell, to Comics Editor Harold Straubing of the syndicate, to Platt—and back again. Fans call attention to the Folwellisms in the strip—the bits of homespun philosophy. To questions on leanings toward wisdom, Mr. Folwell re­plies playfully, "I do remember as a kid being very much im­pressed by somebody's saying Ralph Waldo Emerson was a thinker. It struck me as a good idea, being a thinker, at the time. "I don't know that I could compete with Emerson in that line but," he grinned, "I am also pretty certain he couldn't do anything along this line." Mr. Folwell retired as drama editor last year and now uses a desk in the Herald Tribune Garden News department for his comic strip work.